Graphic representation of DEEP IN (Directed Energy Propulsion for Interstellar Exploration). Experts in interstellar travel have picked future candidates to make the first extrasolar trek. Their names: The nematode Caenorhabditis elegans and tardigrades, otherwise known as water bears. Lubin spoke in late September at the NASA Innovative Advanced Concepts (NIAC) Program's 2017 Symposium in Denver, where he updated his team's progress. At UCSB, Lubin, his students and research colleagues have established the Starlight program, also known as DEEP IN (Directed Energy Propulsion for Interstellar Exploration) and DEIS (Directed Energy Interstellar Studies). This NASA-supported work seeks to use large-scale "directed energy" — that is, lasers — to propel small spacecraft to relativistic speeds to enable humanity's first interstellar missions. The bottom line for interstellar travel: "It will not be easy," Lubin said. "There are many difficult technical issues. It will not be cheap. But it is possible." 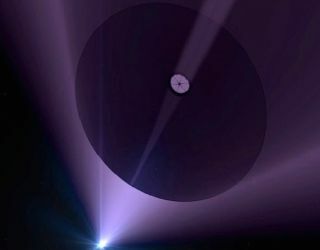 The first interstellar missions will likely ride a beam of laser light. Indeed, the work of Breakthrough Initiatives — via its Breakthrough Starshot effort — is helping to spur a revolution in spacecraft miniaturization that can contribute to the development of "StarChips" that are centimeter- and gram-scale. The StarChip wafer work is progressing and "boldly going where no chip has gone before," said Lubin, who is a project leadership member. In his "Directed Energy for Relativistic Flight" report to NIAC, Lubin cited collaboration with the lab of Joel Rothman in the UCSB Department of Molecular, Cellular and Developmental Biology. The upshot, Lubin noted, is that Caenorhabditis elegans (C. elegans for short), a ubiquitous species of nematode found in soil samples worldwide, and the water-dwelling microanimals called tardigrades, are perfect candidates for "our first interstellar travelers." Caenorhabditis elegans, a ubiquitous species of nematode. Before we ever have the technology to send humans to other stars, Lubin's team explained, scientists plan to send tiny animals that have been shown to survive extreme environments of cold, heat, the vacuum of space, extreme dehydration, high accelerations (tens of thousands of g-forces) and high doses of radiation. C. elegans and tardigrades already have been propelled into space. They've traveled to low Earth orbit during the space shuttle program and have flown on the International Space Station. These minuscule animals have a number of traits that make them model passengers for long interstellar voyages, Lubin and his study group reported. "We can do one or the other (or both), but anhydrobiosis doesn't require freezing and vice-versa," Rothman said in an email. Water-dwelling microanimals called tardigrades, also known as water bears, are incredibly tough and hardy. Is Earth life native to Earth? Scientists at the UCSB Rothman Lab are studying the behavior of these tiny subjects to better understand their behavior and needs before sending them into space. Meanwhile, scientists at the Lubin Lab, in the Starlight program, are figuring out what kind of tiny chambers to design for them, where to place them on "wafersats," and how to wake them up at various points in the journey and remotely observe their behavior. Here are some key questions to ponder: Will these animals survive? Could they take root on another planet with water? And how did they get to Earth in the first place? Could they have come here from some other solar system? "There is no reasonable doubt that worms and tardigrades arose on this planet from the earliest terrestrial organisms," Rothman said. "The question really is, how did life get to the Earth in the first place? Did it spontaneously arise in the rich broth of the early seas of the young planet, or was it seeded from another distant source?" Furthermore, Rothman noted that, although it's reasonable to wonder whether the simplest life-forms (bacteria) might have come to Earth from another solar system, "it is virtually certain that all complex life-forms, including animals, arose on this planet during the long process of biological evolution that began about 4 billion years ago, shortly after the planet could even conceivably sustain life. That conclusion is based in part on the universality of the genetic code, metabolic pathways and the structure of many universally [used] proteins, as well the evolutionary relationships throughout the tree of life that can be inferred from the analysis of extant genomes." Shooting for the stars! The UCSB team. In his NIAC-sponsored work, Lubin underscored the major challenges ahead for directed-energy interstellar flight. How do we maintain the drive toward this goal? Interstellar travel necessitates a dedicated program over a long period, and the U.S. should lead this transformation, Lubin concluded. For more information on Starlight – Directed Energy for Relativistic Interstellar Missions work, go to http://www.deepspace.ucsb.edu/projects/starlight.